A boat trip out to the waterbird breeding colony, usually passing many Christmas Island Frigatebirds on the way. 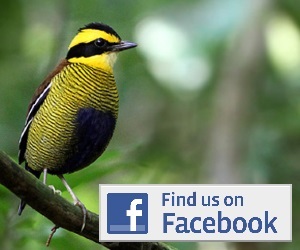 The best birding at Pulau Rambut is the trip out, and the island itself. Assuming you hire a boat to get there (see below), you can direct the driver to pass close by the many fish traps you see on the 30 min journey out. The wooden poles of these traps can support big flocks of Christmas Island Frigatebird (hundreds some time), and smaller numbers of Lesser Frigatebird. If the birds are there you can often approach very closely. It is also worth looking out for Aleutian Terns around here, as they have been seen in the Jakarta Bay. The island itself supports a big heronry, which can be viewed from a metal observation tower. The heronry has a few pairs of breeding Milky Storks present, so this can be a very reliable site to see this species well. There are usually Glossy Ibis and occasionally Black-headed Ibis present too. As the island is relatively undisturbed, it can also be a good place to see Javan Myna; a species becoming rare on the mainland. In May 2014 there was a Nicobar Pigeon on the trail to the tower, so they probably visit the island irregularly. The drive toward Pulau Rambut passes through an area of bare fish ponds. As uninviting as this area looks, it is the best habitat to look for Javan Plover. Scanning about from the road, or wandering off along the fish pond banks should produce this species. Pulau Rambut is most easily accessed by taking a car/taxi to Tanjung Pasir. This is the name of the village at the end of the road from which boats leave to the Pulau Seribu Islands. It is also something of a weekend hang out for locals. There is a large car park and many food stalls. If you sit in any of the food stalls you will probably be approached by a boat owner offering you a ride (if you are not approached, ask the food stall owner). You should expect to pay around Rp 200,000-300,000 for a half-day charter. This would be enough to see everything of the site. Another possibility is to charter the boat at the ‘guard house’ in Muara Angke, but this will be a much more expensive option (more than 1 million IDR). When you land on the island you will probably be asked to produce your ‘simaksi’ (see under Muara Angke for more details). Assuming you don’t have one, just smile and politely ask if you can pay the guards direct to enter the reserve, then offer around Rp 20,000. You don’t need a guide on the island, as there is only really one short path that leads to the observation tower. Scroll down the page for related information, including photos, comments, trip reports, guides and services, articles and news. Please help others by leaving a comment if you find anything different to the way it is described. Last updated Feb 2014. I have visited the island on the 22 july. 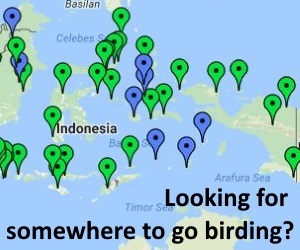 Just flagged a bluebird off at Muara Angke and driven to Tanjung Pasir village and then back to my Airport hotel for 400 Ind. I have arrived to Tanjung P village a bit late and I was possibly exploited by the boatie charging 500Ind for the trip but I didn’t really have other options for seeing Milky Storks! Once on the island payed 200 Ind for the entry and the guide accompanied me to the tower where I had two chicks on the nest and after an hour waiting finally an adult came in! Middle of the day is clearly not ideal here! Also a few Glossy Ibis and a WB Sea Eagle with a beautiful sea snake was mentionable! On the way back to the airport popped in to see the Javan Plovers at the site marked on this sites map at the rice paddies!